Quite unlike the blazing red chicken curry which is synonymous to Indian cuisine, the Korma is mellow but regal and very much an Indian chicken curry too; rich, creamy, nutty it is redolent of aromatic spices with an exotic taste that is going to take you by surprise. The dish is not bold or fiery, but subtle, calm and rich with all its creamy goodness and full burst of flavors, with little bites of nuts and raisins. Do not be deceived by the pale looks, for there is definitely a lot more to its taste and flavors. Updated January 6, 2011: The giveaway is now closed! 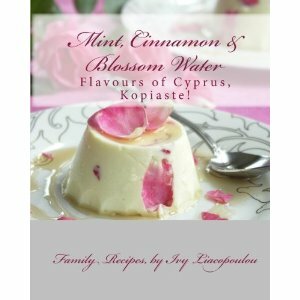 I had promised to giveaway Ivy’s Cookbook – “Mint, Cinnamon and Blossom Water” in an earlier post. Her book is here!! 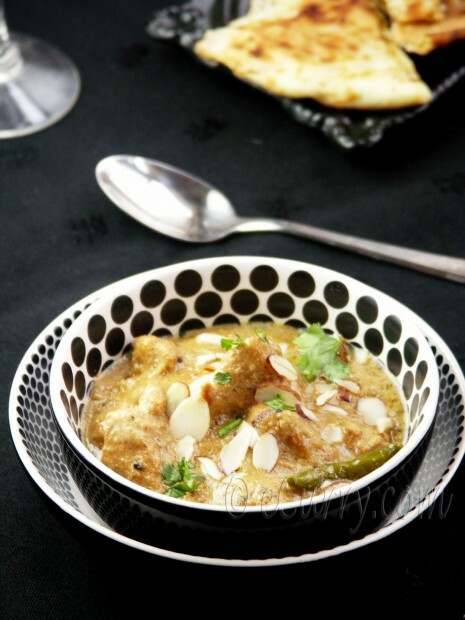 The Chicken Korma is also known as the Mughlai Chicken. 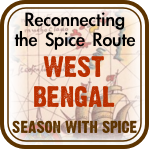 Influences on Indian food can be traced back with the waves of invasions the country went though in the past. The Aryans, Greeks, Mongols, Persians, Turks, Portuguese, French, British and as well as Chinese people invaded India and brought in their bits of food and technique with them, which were slowly absorbed and combined with the original cuisine of India. 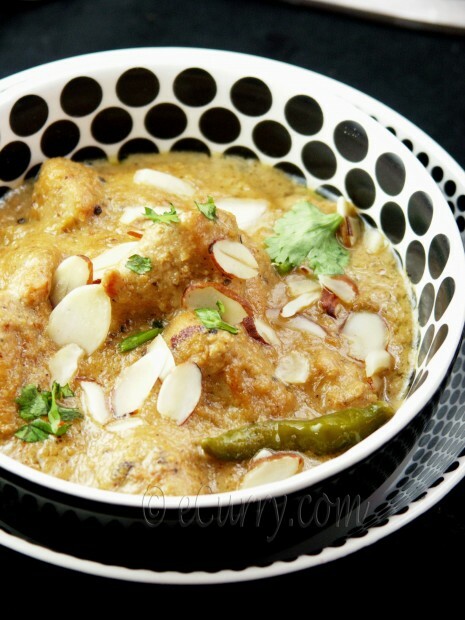 The concept of Korma/Qorma holds its roots in the Mughlai cuisine; the richness of the dish is contributed by the nut paste and cream and saffron. 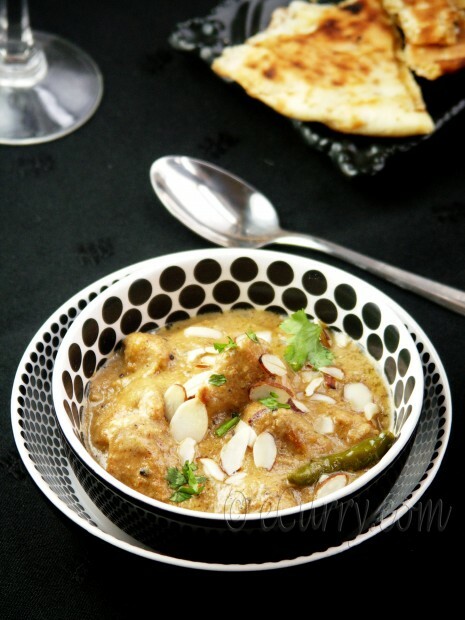 “The korma style is similar to all other braising techniques in that the meat or vegetable is first cooked briskly or seared using a high heat and then subjected to long, slow cooking using moist heat and a minimum of added liquid. The pot may be sealed with dough during the last stages of cooking.” (Wiki). The spices and the kinds of nuts used may vary regionally or from home to home. The northern states will use almonds and dry fruits in the dish, while the southern states might go for cashew and coconut. Sometimes a combination of both almond and cashew are used. Mawa/Khoya/almost solid thickened milk may be used along with the cream to make it far more rich and creamy than I have done it here. The recipe here today is mine, the way I make it at home. I am not claiming this to be an authentic Mughlai traditional recipe. Compared to the very traditional, I would say my recipe is the one in moderation. The ingredients I have used here are pretty much the usual ones used for Korma. I like to add raisins as much as I like it spiced up hot with a lot of green peppers. Both raisins and peppers are optional, but I feel the sweet balances the spicy really well. Some recipes use a white poppy seed paste which is usually added when the nut paste is added, but today I have not used the poppy seed paste. Do keep in mind the use of ghee is essential for the flavors of this dish. Whatever way it is done, with all the exotic spices, cream, yogurt and nuts that are used here, it is a dish elegant enough to be served at a King’s table! Heat 1/2 tablespoon oil Add a pinch of sugar and add the sliced onions (of the 1/2 onion). Fry the onions till they brown and caramelize. Remove with a slotted spoon and set aside. Sprinkle salt on the chicken pieces and rub in along with lemon juice. Combine and whisk the rest of the ingredients for the marinade and marinate the chicken for at least a couple of hours; if you have time to do it overnight, it is even better. Heat two tablespoons of ghee/butter/oil in a pan, add cinnamon, cloves, green cardamoms and bay leaves and sauté. Poke a hole or make a small slit on each of the chili pepper to prevent them from popping in the oil. Add onions, green chili pepper and the mace powder and sauté at medium heat till the onions starts to get light brown. Add the 2 tablespoons of ginger, and 1 tablespoon garlic paste; sauté and cook with the onions at low to medium heat till oil separates – you will see that the masala/spice mix will release the oil that it had absorbed. Add 3/4 cup of hot water and salt and bring it to a boil. Cook/simmer till the paste thickens a bit and there is no extra water floating on the top. Optional: Cool and blend it in to a puree. It is okay if you do not puree. 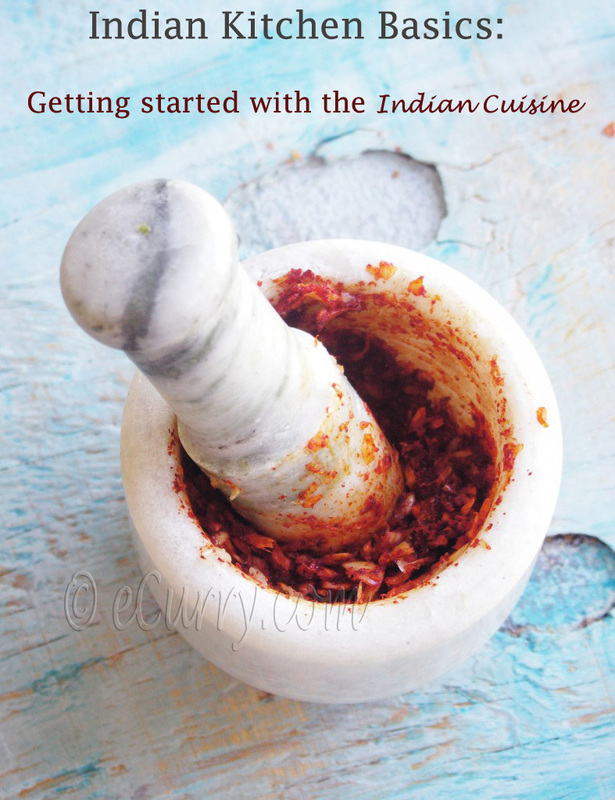 The texture of the sauce gets smooth and creamy if the masala mix is pureed. Heat 3 tablespoons of ghee in a pan and add the marinated chicken pieces; cook while tossing them occasionally until they start browning on the sides. The meat should be almost done. Add the pureed masala mix or if you have not pureed, add the onion – ginger-garlic mix to the pan. Add the raisins to the pan. Toss well to combine. Cook for about five minutes. Lower the heat and let the temperature of the pan come down a bit. (the yogurt tends to split/curdle is the temperature is high). Whisk the yogurt till smooth and it is lump free. Add the yogurt, sugar, and the almond powder/paste and let it simmer at low heat for about 8-10 minutes. If you feel it is too thick, feel free to add about 1/2 -3/4 cup of hot water and simmer it down to your desired consistency of the sauce. Add the caramelized onions to the pan. Add the heavy cream; gently stir to mix. Add the saffron, white pepper powder and cardamom powder. Stir everything in, partially cover it and allow it to gently simmer at low – medium heat for 6-8 minutes or until you see a thin film of ghee appear as the top most layer above the sauce. (Once the sauce starts to release the ghee/oil, it indicates that it is cooked completely; all the fat that had been absorbed during the cooking process is being released now). Garnish with slivered or sliced almonds and more caramelized onions and raisins if you wish. Serve with rice/pulao/pilaf or bread/roti/naan. This is indeed a regal dish; a very different from the more asked for butter chicken or the chicken tikka masala. If you are fond of Indian food, and if you haven’t had the korma yet, do give it a try and you will fall in love with it! It is a different kind but outrageously delicious! Wow! That Chicken Korma looks great! Fabuloue looking creamy chicken korma. Tomar ei style er preparation korbo ei weekend e. Will skip raisins though….Enjoying having good quality time with your family Soma. Rice … for me it will be with rice. 🙂 Looks awesome Soma. Love those polka dot bowls. You make all your dishes look exotic and delicious! yummm! Look at all the spices and chillis in the ingredient list! LOVE chicken korma! Thanks for sharing the recipe Soma ‘cos I have never tried making it myself before. Gotta give this one a try this holiday. Hope things r going great with you! Keeping busy? SomaDi,Love almost all ur recipies,this one is looking wonderful……will try it sure…..
SomaDi,Love almost all of ur recipies,this one is looking wonderful……will try it sure….. This looks very unique and something I would definitely want to try soon, thanks for sharing! A fabulous korma! So enjoyable. I’d love to win Ivy’s book! A great giveaway. love Mediterranean food and would love to own this book. the korma looks delicious…unique clicks as always. Love the presentation of this dish! I’m a big fan of Korma and I bet I would really love this! The gravy is quiet rich, never made this way. Sounds perfect for special occasion. Soma..Daarun dekhache….As usual tomar chobi gulo eto bhalo je kaar prosongsha korbo..Reciper, chobir naa tomar….. I love your recipes, and this one sounds wonderful. Great giveaway! Thanks for the opportunity to win. Another great dish I need to try making at home! The mix of sweet and spicy sounds delicious. Mail korbo aaj, ok ? Here’s wishing you and your family a happy and prosperous 2011! Thanks for linking this great recipe on Serious Eats! I plan to try it. I also like your blog! 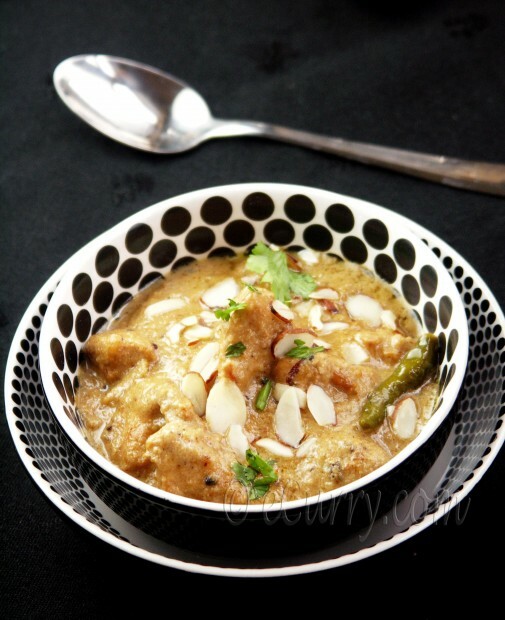 I love korma…and the food pics! Mmmm I love chicken korma, and yours looks wonderful…I can almost smell it now! This is a great giveaway I would love Ivy’s book! Now I’m off to tweet about it! This looks delish! I will definitely be trying it. Also, I love the polka dot dishes. The Korma looks fantastic! Definitely on this month’s planning list. 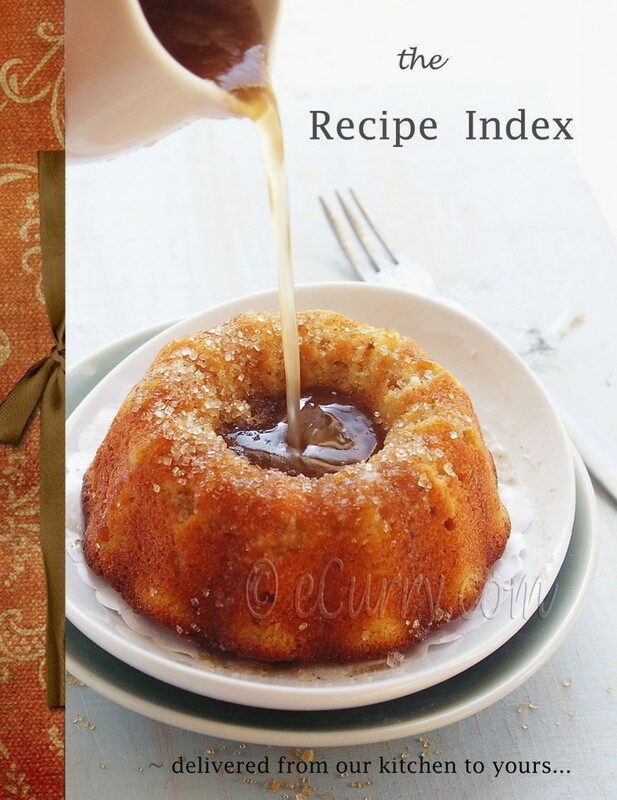 Thanks for the chance to win the cookbook. Lovely dish and photos! Great giveaway! This is indeed outrageously royal !! Gonna cook this tonight !!! Sushanta could not be happier !! i love this website.becoz i m getting the every dish of recipies.this is good for me becoz i m doing hm cookery course. 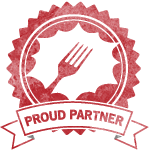 Just made it – what a wonderfully rich, creamy and flavorful dish! This looks wonderful. I wonder; what differentiates a Kashmiri from a Korma? Would it be the use of mango, coconut and/or garam masala? Great dish by the way! While Korma has a few things the the Kashmiri uses, they are quite different. The mango is used in neither kormas or kashmiris. The coconut is used in Korma but mostly the korma from the southern regions of India. 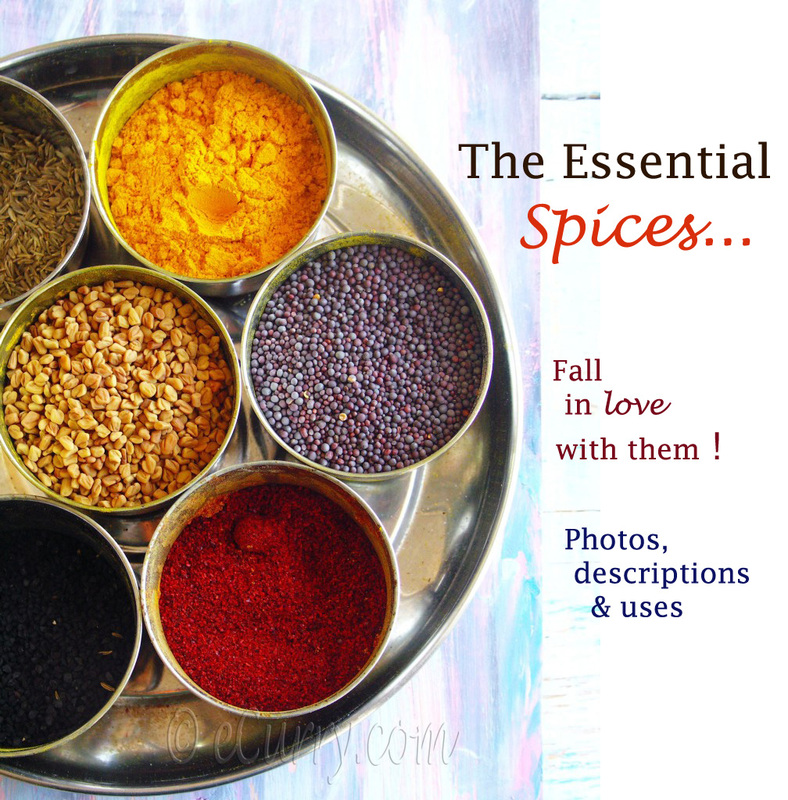 The kormas of Northern India uses more of Garam Masala, nut paste, dry fruits etc. The state of Kashmir in India uses very specific spices and has unique flavors. 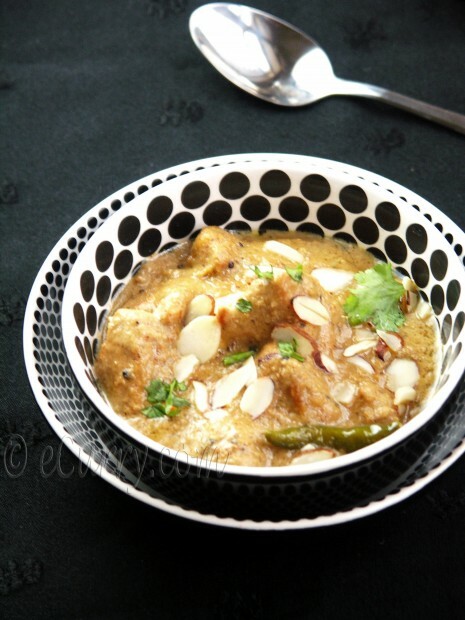 This recipe here of Kashmiri Dum Aloo http://www.ecurry.com/blog/indian/curries/gravies/kashmiri-dum-aloo-baby-potatoes-cooked-in-fragrant-spices-and-yogurt-sauce/ . Hope this kind of makes sense! Hi Soma from sunny southern Arizona! Last night I made this dish. Wow wow wow! This recipe makes truly delicious chicken. The flavors and textures were spot on. This morning we had leftovers for breakfast and marveled again at how good it was. Learning to cook Indian food is a hobby that I truly enjoy. Thanks so much for sharing this awesome recipe. I look forward to making this again.